You need to apply the right gear at the right time to get maximum power. The same goes for your digital business. It is not enough to just change technologies to be digital. You have to shatter long-held beliefs about business, organization, leadership, accountability, customer relations etc. by applying data and analytics to create and manage smart business processes. Not in increments, but throughout the system. While trying to overtake competition, it is tempting to push the wrong gear at the wrong turn. The result? A catastrophic spiral into a nasty crash. Thus, take note of the below five gears. The slow but steady decline of Nokia acted as a wake-up call to the mobile industry. They kept adapting to innovations on the sidelines. The pace of technology and idea advancement in this century, sadly, far outstrips the core beliefs hardwired in the system. This will not do when millions are at stake. Failure to grasp the market realities and evolve mindsets will lead to disaster and annihilation in the rapidly dynamic competitive field. Challenging outdated thinking for optimizing business processes is the first way to go. Only through complete and accelerated digital transformation, can your business increase its core competency that leverages new opportunities. Incremental upgrades will not work and will mostly act as a stop gap measure. A measure that is unscalable, costly, ineffective and will make your business redundant. The current trend is to use digital to fix existing business problems. This is wrong. In order to tame the digital landscape, you need to change the focus from fixing problems to augmenting digital capabilities and effectiveness to take a leadership role in the industry. Be it in deploying smart modelers for cross-selling or approving loans in three minutes, you need to have a 'lead first' mentality to be fully prepared for the digital economy. Your IT department is increasingly getting exposed to customers. The level of human touch is consistently getting reduced due to the digital onslaught. Disruption in internal systems and processes in the form of self-buying journeys are giving rise to independent and self sufficient e-commerce platforms, that open up new revenue opportunities. Organizations will achieve digital business success by rethinking their approach to process and solution innovation. Enterprise IT is transitioning from focusing primarily on traditional back-office automation to enabling direct customer facing digital business and the digital workplace. The IT organization must learn how to deliver innovative solutions to support agility, flexibility and scalability for the new digital business models. Previously, business process management (BPM) scored heavily on efficient processes to achieve operational excellence. To go digital, the first criteria is to make the business process customer-centric. And that requires processes that are integrated, personalized and improvised on the go. Digital CRM has this exact capability with smart tools like Vivid Journey Designer which encapsulates dynamic interactions between three important layers : Users, Machine and information resources. By keeping these fundamentals in mind while creating a digital design, you can deliver a customer experience that will be a differentiator amongst your peers. Remember, going digital is not only about improving key processes but also about re-inventing products and services. Automating business processes makes it scalable and standardized. This empowers the business to deliver consistent results. Workflow automation across multiple businesses processes, departments and product lines will help drive business efficiency and quality. Going digital by redesigning business processes will also make interdepartmental coordination seamless. Your competitors are looking at digital bonfire casualties with glee. 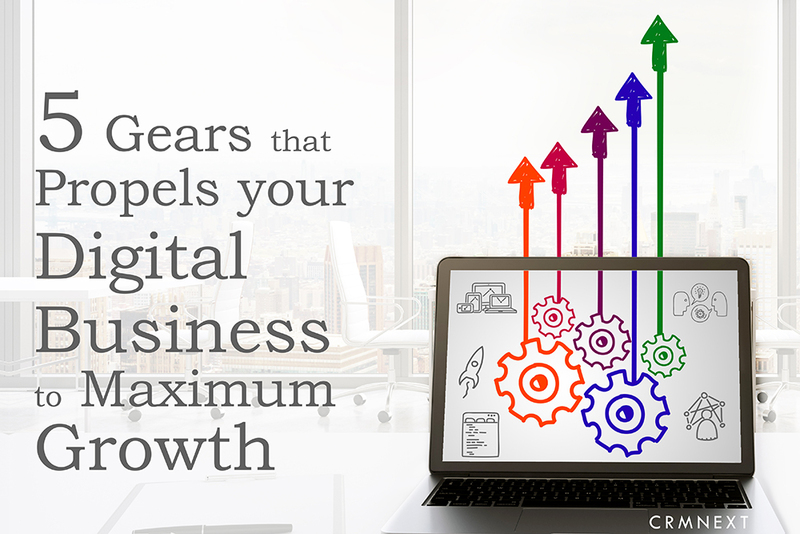 Outstrip them and zoom ahead with the above five gears in CRM solutions.